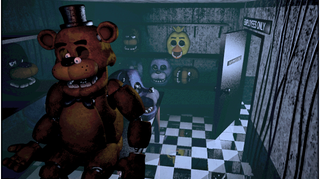 Scott Cawthon, the creator of Five Nights at Freddy’s, knows perfectly well how his series has been received by the public. There are plenty of fans who adore the games, sure. But there’s also a growing backlash spearheaded by people who think Cawthon is just pumping out games to cash in on his success. Some context: in a year, Cawthon has released a total of four Five Nights at Freddy’s games. This, some cynics argue, is absurd—especially when you consider the quality of the games. Where some fans are obsessed with Five Nights at Freddy’s, others think they are simplistic games that don’t deserve the hype or recognition. I don’t necessarily agree with these criticisms, but they do exist. Hi guys. First of all, I wanted to thank the community in general for the huge outpouring of support through emails and in the forums. I know a lot of you are concerned about me or think that I’m stressed out. It’s true that I’m stressed a little; but it’s ok because the result was good. I’ve worked very hard this year, almost non-stop, to produce good games for this series. Even though there may be some debate as to how “good” the games are, I did my best to provide some good scares and a good story. All I can do is judge from the Steam reviews that I’ve been mostly successful; so I’m very happy about that. It’s true that there has been a lot of hate toward me lately; on the forums, on youtube, etc. And I’ll be honest, it’s difficult. It’s difficult when people seem to dislike you only because you’ve found success with something. I think some people have this idea that I spend my days swimming in gold coins like Scrooge McDuck, cranking out games with no effort, then laughing all the way to the bank. The reality is quite different, and I think that people who hate on me for being successful are misguided. Did you know that last year I was working at Dollar General? I worked as a cashier. I had three bosses who were all still in high school. Before that I worked at Target in the backroom freezer, unloading frozen foods. I haven’t had a successful life; and now that God has blessed me with some success, I’m doing my best to be responsible with that success. I don’t party on weekends, I don’t get drunk or sip martinis. I spend my evenings playing Megaman 3, buster only, with my kids. And I try to good with what’s been given to me. I guess the reason I’m telling you all of this is to make sure you know that I’m human. I have a lot of flaws, and I’ve made a lot of mistakes. My games aren’t perfect, and they never will be. But something more important that I want to convey to all of you, is that you should never listen to people who criticize success simply because it’s success. Being good at something is something to strive for, not something to demonize. Criticisms of my games are fine, and a lot of times the criticism is valid. But there are a lot of people out there who will hate anything that becomes popular, just because it’s popular, and hate anyone who becomes successful, just because they are successful. “Haters gonna hate.” –as they say, but I want you to know that focusing on someone else’s failure or success is the wrong way to live. People who make videos bashing other people are like people who run into a public square and scream into a pillow. They’ll get attention, but they won’t change anything. If you strive to be like them, then you’ll spend your life screaming into a pillow as well, and your life won’t mean anything. The best emails I get are from people who have chosen to pursue game development because of the games that I’ve made, or people who have decided to do computer science, or learn programming. Who will be the next game designer? Who will make the next game for Markiplier to play? Make sure that it’s you! People who hate success will never be successful. Focus on your success, and your story. People always ask me what college I recommend, or what programs I recommend. My answer is to just go forward, practice. Just GET to college, study hard, be awesome at what you do. Make sure that you are next year’s big success story. Don’t fall into the pit of people who have given up on making something of themselves, and make sure you make EVERYTHING out of yourself. What a class act. It would have been easy to ignore all the haters, and to just keep doing what he’s doing. But judging from Cawthon’s online presence, he does read a lot of what people say about his games—and it weighs on him. Of course it does. He’s a human being, and it’s pretty easy to lose sight of that when you imagine the boatloads of cash that their success must bring. Here’s hoping some people do take his words to heart and make stuff. Who knows? Maybe they’ll be the next Scott Cawthon.